These jellies are guaranteed to be a huge hit with kids of all ages (particularly the grown-up variety). The best bit is that, unlike traditional jellies from the supermarket, they are not stuffed full of colourings to resemble fluorescent jellyfish. Mix the elderflower cordial with 300ml water. Place 200ml of this liquid in a heatproof bowl. Sprinkle over the gelatine and leave to soak for 5 minutes. Over a pan of simmering water, stir until the gelatine melts and the liquid becomes clear. Stir in the remaining elderflower liquid. 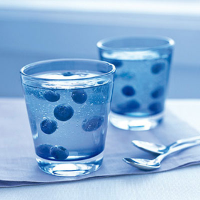 Divide the blueberries into 4 glasses and pour in enough elderflower and gelatine liquid to cover the fruit. Chill for 45 minutes or until set. Pour over the remaining liquid (if this has already set, place it over a pan of gently simmering water for a few minutes) and chill for 3 hours until the jellies are set.